7/17: Ripple (XRP) investors started imploring FINRA to probe Coinbase for possible price manipulation. 7/18: Coinbase retracts the “approval” claim, instead saying it was never given official approval from the SEC and FINRA, but it doesn’t matter because their approval “isn’t necessary” to start listing securities. We shall see what the next couple weeks brings for Coinbase, but it doesn’t look like they are showing any signs of slowing down. BlackRock, the world’s largest exchange-traded fund (ETF) provider, has been causing all sorts of commotion this past week in regards to bitcoin. First, BlackRock reportedly announced earlier this week they were setting up a group to investigate ways they could take advantage of the cryptocurrency market. This news apparently led to an immediate 4% jump in bitcoin’s price. Blackrock’s CEO Larry Fink confirmed the news the next day, but with a caveat: Blackrock themselves aren’t investing in cryptocurrencies anytime soon, claiming that there is no demand from their clients. Greyscale Investments – a crypto investment fund manager – released their personal H1 2018 Digital Asset Investment Report, claiming 56% of $250M raised to date came from institutional investors. Execution Maximalism definition: As the scrutiny for new projects gets greater, only the ones that perform, publicly, at the highest levels will thrive. Nathaniel Whittemore breaks down how this is happening within crypto, and why it is a very good thing. In similar sense, people are starting to claim that crypto in general is doing this to the dollar. Like the DVD replacing the VHS, newer inventions always eventually take over the old. Here’s why fiat currencies would be foolish to they’re any different. What started as banter over Twitter between Litecoin’s (LTC) co-founder Charlie Lee and Derek Capo, CEO of TokenPay has now led to both buying major stakes in a German bank. When the news broke, it was met with enthusiasm as well as skepticism from the crypto community. Here’s the good, the bad and the ugly. “The Web3 Stack” is an essential deep dive that demands reading, bookmarking, and reading again. Kyle Samani’s post serves as both a guide to what’s being built – while highlighting areas where more attention will be needed over the coming years to make dapps useable. Excitement is bubbling in Dallas, Texas. Teeka Tiwari and Glenn Beck’s LIVE cryptocurrency broadcast starts tomorrow at 8pm sharp. Make sure your speakers are working. And make sure you have a pen and paper handy. Because tomorrow, Teeka is going to reveal the biggest and boldest prediction of his career… It’s about a new development in the crypto market from just a few days ago that could see the price of Bitcoin increase 10X from today… (and a handful of smaller crypto’s could go up far more). 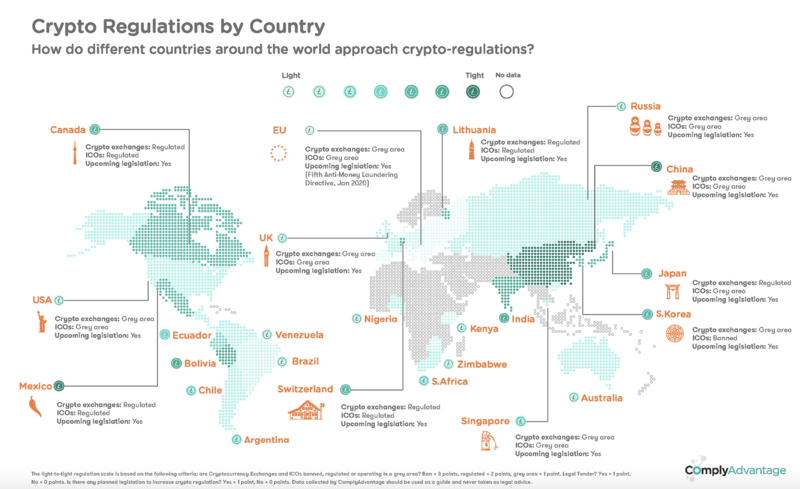 🌎 What Are The Different Crypto Regulations For Each Country? Another week, another announcement of a major exchange and Malta working in collaboration. This time, Binance broke the news on it’s plan to set up the world’s first ‘decentralized’ bank in Malta. Bitcoin (BTC) has witnessed a spectacular 30% move in 2.5 weeks and is currently sitting at $7300. But, the market is getting pretty close to overextending itself from a technical standpoint. And recent bearish news stories, including Coinbase recanting their whole story, doesn’t help much. 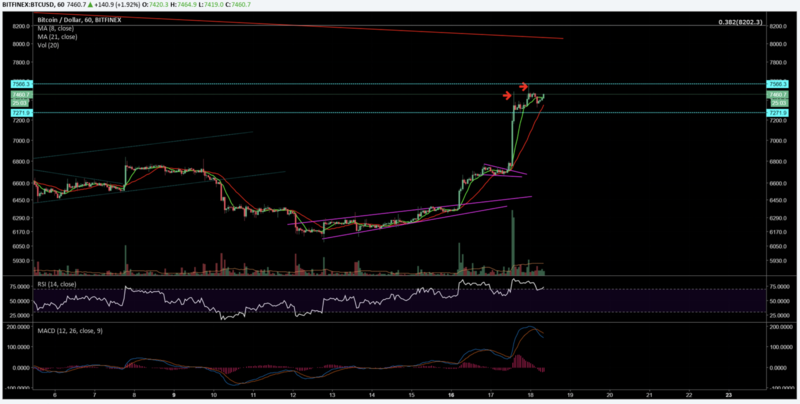 As shown above, bitcoin needs to hold above $7200 to remain bullish. 📌 Malta’s Making Moves, Leaked Billionaire Rant, and a Google-Cardano Partnership?